The Department of State Services has detained Mr. Baba-Inna, who is the Aide De Camp to the wife of the President, Mrs. Aisha Buhari over an allegation of N2.5 billion fraud. Spokesman for the DSS, Mr. Nnochirionye Afunanya, told our correspondent that the case was handed over to the agency by the Police authority. “His case was handed over by the Police and investigation is ongoing,” he said. 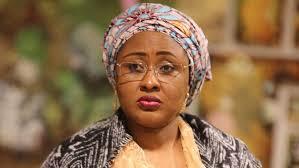 Aisha was said to have alleged that Baba-Inna received huge donations from politicians, businessmen, and women on her behalf and refused to hand them over to her. She was, therefore, said to have urged the Inspector General of Police, Mr. Ibrahim Idris, to arrest and compel Mr. Baba-Inna to refund the money, estimated at N2.5billion. Our correspondent gathered that the DSS had set up a team of investigators to unravel the case. It was also gathered that the team had asked for the bank accounts of the police officer and that of his wife, and would also visit his house.